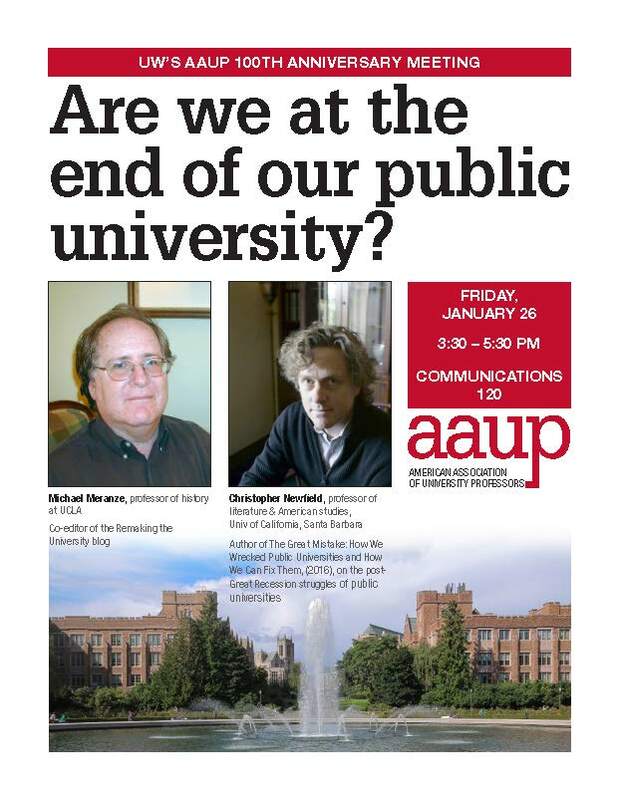 Michael Meranze (UCLA history professor) and Chris Newfield spoke to our 100th anniversary annual meeting about the future of higher public education in the US. It was a call to action! It’s up to faculty to defend our beloved public universities, to protect them from privatization, skyrocketing tuition, and control by philanthrocapitalists. See the Video here! See our new OPINION page! See our message to the City of Seattle re. UW master plan 2017. UW AAUP accepts well researched opinion pieces on a wide variety of subjects related to academic freedom, university governance, and other issues relevant to UW faculty. Opinions are not necessarily those of UW AAUP. Submit your piece to Dan Jacoby, president, jacoby@uw.edu. AAUP meetings are held monthly during the school year, 3:30 pm to 5 pm. All meetings are in the University of Washington Club [map] unless otherwise noted. They are open to all faculty, librarians and graduate students. In addition to regular meetings, we also hold occasional working group meetings and hold strategic planning retreats generally every other year. In the wake of the 2016 presidential election, the national AAUP approved a resolution condemning campus hate crimes and supporting the campus sanctuary movement. Sign up here for information and updates about the campus sanctuary movement. See the text of the Council’s resolution here. AAUP board members met with President Ana Mari Cauce on 24 February 2017 to discuss a potential hate crime on campus that occurred 15 November 2016. Notes from that meeting HERE. Message to AAUP list server regarding the incident and the meeting HERE. The UW chapter of AAUP has crafted this syllabus paragraph on academic freedom you may want to use. Click HERE. 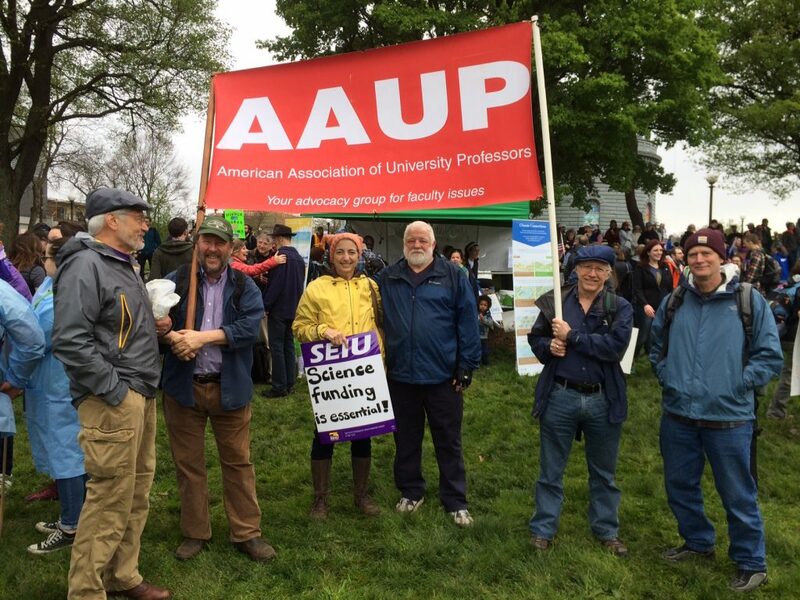 AAUP chapter members at the April 22, 2017, Science March in Seattle. On November 8, 2016, voters in the United States, after a tumultuous campaign season, elected a presidential candidate whose campaign rhetoric reflected hostility toward people from many walks of life, and proposed policies that would erode human, civil and labor rights. Since the election, the President-Elect’s appointments have included individuals who have advocated for white nationalism, denied climate change science, opposed civil liberties for minority voters, and opposed human rights for Muslims, among other concerns, suggesting some campaign rhetoric will become policy. 2016-2017 Board election: Every even-numbered year we elect a full slate of new board members. (In 2017 we added a couple of members to fill in for vacancies.) Our bylaws indicate 15 at-large members, along with officers. 2016 election yielded 9 incumbents: Christoph Giebel, Michael Honey, Jay Johnson, Bruce Kochis, Max Lieblich, Ann Mescher, Diane Morrison, Duane Storti, and Libi Sundermann. Five new board members join us: Hwasook Nam, Charlie Collins, James Liner, Eva Cherniavsky, and Jim Gregory. Officers are Dan Jacoby/president, Amy Hagopian/secretary, Bert Stover/treasurer, Abraham Flaxman/VP for mailing list, and Rob Wood/past-president. UW AAUP hosted a team from Rutgers University at our May 9th annual meeting. Guests included David Hughes, AAUP/AFT union president, Karen Stubaus, VP for Academic Affairs and Administration, and Ann Gould, chair of Rutgers’ University Senate. They staged a conversation about how unions, administration and the Senate interact on a large, highly-regarded university campus. Video here. AAUP expresses dismay about the failure to have an open search for the appointment of a permanent Provost. Statement here: 22 April 2016 memo re provost. The University of Washington Chapter of the American Association of University Professors supports an amendment to RCW 28B.20.100 to read as follows: “The governance of the University of Washington shall be vested in a board of regents to consist of ten members, one of whom shall be the immediate past chair of the University of Washington faculty senate and one of whom shall be a student. The governor shall select the student member from a list of candidates, of at least three and not more than five, submitted by the governing body of the associated students. ((They)) Except for the immediate past chair of the University of Washington faculty senate member, the other members shall be appointed by the governor with the consent of the senate, and, except for the student member, shall hold their offices for a term of six years from the first day of October and until their successors shall be appointed and qualified.” We appreciate the work of Representatives Pollet, Tarleton, Reykdal, Stanford, McBride and Bergquist to introduce the Bill into the 64th Legislature, 2016 Regular Session. UW AAUP endorses Tent City III encampment on UW campus, 10 Jan 2016. Letter of Support for a UW hosting of Tent City III in winter quarter 2017. UW AAUP endorses Faculty Senate salary policy on Dec. 2, 2015. UW AAUP expresses dismay about the October, 2015, burglary at the UW Center for Human Rights, in which a computer containing sensitive human rights information disappeared. 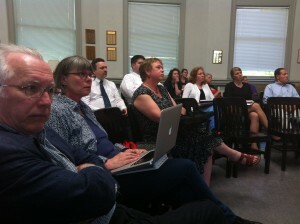 National AAUP blog carried the story, too. Faculty Survey results announced 27 July 2015! Washington state 2011 legislative research report on faculty employment available here. Click here for a report of our AAUP-UW’s Annual Meeting. Child Care Presentation at the UW, presented to Faculty Senate April 21, 2015, by AAUP member Ann Mescher. Last week, the Washington State Senate announced its 2015-17 budget, which includes $674 million in funding from the Near General Fund for UW. It also includes lowering tuition rates by basing them on a percentage of average income. This is at first glance higher than both the House and the Governor’s budgeting for UW and Higher Ed in general, and the rollback on undergraduate tuition is laudable. Although no one ever mentions graduate tuition, which has skyrocketed while we focus on undergraduates. It’s worrisome that the Senate’s budget cuts financial aid by as much as $53 million and fails to fully fund already-committed state employee contracts, undermining the well-being of tens of thousands of UW students and workers. Creating a formulaic relationship between income and tuition ignores the cost of running the institution. The state allocation to the UW, supplemented by tuition, should be driven by the amount of money we need to sustain the university. Further, the Senate allocates $1000 to the UW to spend on raises for each FTE campus worker every two years. Even if that was a good idea, which it isn’t because it pits UW faculty and staff against students, it turns out that isn’t even legal. State collective bargaining laws establish that employee unions must negotiate their contracts with the governor’s office, not the Legislature. Perhaps even worse, the Senate budget includes no new revenue to fund any of this, is based on fund transfers and cuts to other vital areas of the budget, and even includes new tax exemptions such as a $72 million giveaway to Microsoft. It includes a lot of smoke and mirrors, but in the end will not generate the resources needed to fully fund education. The Senate budget temporarily by transfers funds from important state activities to higher ed, but that won’t last. That sort of budget-making seriously undermines the long-term position of higher education, because it pits us against K-12, social services, transportation, and other general fund priorities. Higher ed never fares well in those set ups. Both Governor Inslee and the House accomplish similar goals with better, more sustainable budgets. The House raises up to $1.7 billion in new revenue via Business and Operation tax reform, Capital Gains taxes and closing unfair tax exemptions for the wealthy, not creating new ones. But all three budgets mask a deeper problem, the drastic and disturbing abandonment by Washington State of its funding obligation for higher education in the wake of the Great Recession. From 2007-13, higher education funding suffered cuts of 26%. In 2011-13 alone, higher education funding was $1.3 billion below maintenance level. The current higher education budgets are all a significant increase over previous years, but still don’t make up for the losses sustained from 2007-13. Here at the UW, we received $402 million in state appropriations in FY 2009; in 2012-2013 that sum was only $209 million. We implore the UW Regents to endorse the House budget over the Senate’s, and to act as advocates for fully funding education from birth to graduation by asking the state’s significant number of wealthy individuals to pay their fair share. They are perfectly able to contribute to the cost of the infrastructure that helps preserve their wealth. Corporations, too, can pay their fair share. Including the ones many of you work for. But it’s not enough to advocate for more funding. We have to name sources of funding, such as capital gains, income taxes, or carbon taxes. Preferably all three. That is the only way to move this forward, by sharing the political cost of recommending specific new taxes. I am writing on behalf of the University of Washington Chapter of the American Association of University Professors (AAUP) to respectfully request that the April 9th Regents meeting be moved to a location that is accessible by the UW community that the Regents represent. The meeting was originally scheduled to be in the Petersen Room at the University of Washington, Seattle, but was moved to Cedarbrook Lodge in SeaTac relatively recently. Reaching this location requires roughly an hour and a half of travel by public transportation from the Seattle campus, which severely limits participation by faculty, staff and students. Shared governance is a central pillar of the mission of AAUP. Holding the Regents meeting at a location far from the tri-campus UW system sends the unfortunate message that the Regents are not interested in faculty, student and staff participation in the meeting. This is particularly troubling during a year in which a strong partnership between the UW community, the Regents, and the Washington State legislature has arguably never been more important. We hope that the Regents can change the meeting location to a site more accessible to the UW community. On Monday April 6th at 6:00-8:30pm, Steven Salaita will be giving a talk entitled Indigenous Peoples and Academic Freedom in the New Era of Civility at the University of Washington, Seattle. The talk is in Gowen 301 and is free and open to the public. Prof. Salaita was ‘unhired’ in the summer at the University of Illinois at Urbana-Champaign over his extra-mural speech that was deemed ‘uncivil.’ His case last year constituted one of the worst assaults against academic freedom, speech and due process rights, and shared governance nation-wide and received the condemnation of thousands of academics and many professional organizations, AAUP prominently included. AAUP-UW is co-sponsoring Prof. Salaita’s talk at UW in unwavering support of the core principles of our profession and the academy at stake and out of solidarity given the injustices he has suffered, without taking a position on other issues raised by this case or endorsing Prof. Salaita’s pronouncements. Steven Salaita is an independent scholar and author of six books including Israel’s Dead Soul(2011); Modern Arab American Fiction: A Reader’s Guide(2011); The Holy Land in Transit: Colonialism and the Quest for Canaan(2006); and Anti-Arab Racism in the USA: Where It Comes from and What It Means for Politics(2006), winner of an Outstanding Book Award from the Gustavus Myers Center for the Study of Bigotry and Human Rights. With the recent announcement that President Michael Young will leave the University of Washington to assume leadership of Texas A&M, the process of selecting his successor will soon begin. The University of Washington chapter of the American Association of University Professors (AAUP-UW) calls upon the Board of Regents to conduct the search for the next President of the University of Washington in a manner that respects the appropriate role of faculty representatives in the search process. It should balance any need for confidentiality in early stages of the search with the need for transparency and faculty participation in its later phases. In the search that resulted in the 2011 hire of President Young, the Chair of the Faculty Senate was included on the search committee but was sworn to secrecy until after the decision had been made and announced. Such practices undermine the ability of faculty senate leadership to keep other faculty members informed and fulfill their role as faculty representatives, and are thus incompatible with widely accepted standards of shared governance. Searches should have an open final phase that allows individual faculty members as well as faculty bodies to review the credentials of finalists, ask questions, and share opinions before a final decision is made. Does Washington have a Constitutional obligation to fund higher education at a decent level? January meeting of the AAUP board was at UW TACOMA! Look for minutes soon. National AAUP has established a 10-point AAUP Centennial Declaration. The university is a public good, not a private profit-making institution, and corporations or business interests should not dictate teaching or research agendas. The life of a university should reflect all dimensions of human endeavor and be built on the full and open participation of diverse faculty and students. The main aim of research is to create new knowledge, and academic freedom is essential for the free search for truth and its free expression. Research is not just about enhancing the profit margins of corporations. All who work at universities are entitled to a dignified and collegial workplace free of surveillance and authoritarian dictates and to resist the degradation of their working conditions. Students are the next generation of enlightened and humane citizens, not just revenue streams or the bearers of collateral for unsustainable debt loads. Information and communications technologies are welcome tools for teaching and research but should not be used to impoverish the quality of education or reduce faculty-student contact time. University management should resist public education cutbacks and reverse the multiplying of senior management posts, many of which are unnecessary. Faculty shared governance is the cornerstone of any university that values teaching and research. The authority of faculty in hiring decisions, promotions, and curricular matters should not be compromised by donors, trustees, or administrators. Similarly, the faculty voice in budgeting, institutional planning, and other internal operations should not be marginalized. Curious about Washington state university presidential salaries? 9 Oct 2014 Seattle Times–President Young’s salary was set by the Board of Regents at $853,508, including a salary of $622,008, deferred compensation of $193,500, a $12,000 per year car allowance and a retirement plan contribution of $26,000. Young also received a 4 percent raise last year. September 2014 Dear Colleagues, Welcome back to the new academic year from the AAUP-UW chapter. I’d like to say a few words about the critical topics our chapter will be focused on over the coming year. Higher Education Financing: This year promises to be a challenging one for higher education in Washington State, with the legislature required to find adequate funding for K-12 education following the 2012 “McCleary” decision of the state Supreme Court. Indeed, the court recently found the legislature to be in contempt for failing to act by now. We anticipate a tough budget fight this year. Washington’s public universities have been asked by the state Office of Financial Management (OFM) to model another 15% cut to our state funding. This would have devastating results and would undoubtedly lead to further tuition increases. A good sign is that the presidents of all of the state’s six public universities have refused to conduct this modeling. Our 2013/14 survey of faculty indicated that higher education financing is one of the key issues for our chapter. We began work on this topic last year, with a forum on Higher Education Financing. We will continue to work on this topic this year. 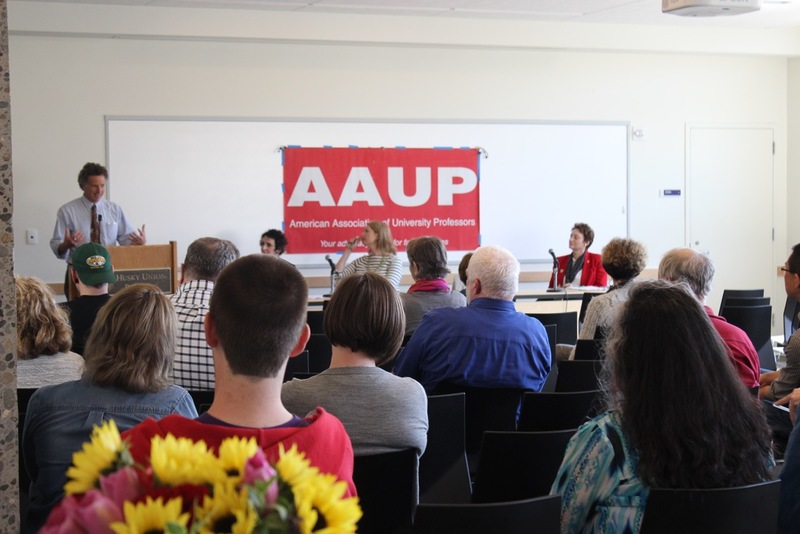 AAUP-UW is a cosponsor of the Stand Up for Education campaign, which recently released a white paper, Protecting Washington’s Future, calling for new revenue to ensure that education from early childhood to college is adequately funded in the state. Lecturers: This year will be a critical one for lecturers on our three campuses. Lecturer committees were set up by the Provost and the Faculty Senate to make recommendations about how to address the poor working conditions experienced by many of our lecturers. All three campus committees and a tricampus committee have issued reports with a variety of different recommendations, and this year the Faculty Senate will be working with the UW administration on solutions. AAUP-UW will continue to work to ensure better job security for all lecturers including those in full and part-time positions. Ultimately, we would like to see the creation of promotable instructional professor track equivalent to that for our academic and research faculty. We successfully supported a unit of lecturers (represented by the AFT union), who recently settled a successful contract negotiation that took two years. Unionization: In our 2013/14 faculty survey, a third of respondents said that AAUP should explore forming a collective bargaining unit, while another third were unsure. Collective bargaining offers many advantages. Academic collective bargaining has ramped up dramatically in the last few years, in large part due to the erosion of faculty job security and tenure. In particular, contingent faculty (both instructional and research focused) at UW face increasingly insecure work situations. In addition, the UW grievance system does not serve faculty, and is in need of repair. AAUP-UW will work to explore faculty unionization on our campuses and work with the Faculty Senate to address the grievance problem. 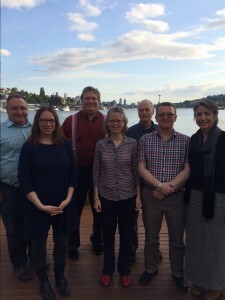 Executive Board: AAUP-UW has a board of faculty colleagues who conduct much of the chapter work of AAUP. Over the last couple of years, board members have been instrumental in working to uphold AAUP principles on the UW campus. Examples of this include the work our board members carried out to ensure new and stronger Class-A academic freedom legislation that was introduced into the faculty code earlier this year. Board members are also responsible for sourcing and posting many of the relevant news articles on the AAUP listserver (see below). Chapter meetings: We hold chapter meetings twice or three times quarterly. Meeting information is posted on the meetings page on our website. Agendas and minutes will be posted on the website and sent to chapter members and to the AAUP listserver. Listserver: You are receiving this email because you subscribe to the list server sponsored and moderated by the UW Chapter of the AAUP. We would be grateful if you could circulate this message to new faculty colleagues in your departments/units. You do not have to be an AAUP member (see below) to subscribe. Just send a message to aaup@u.washington.edu to sign up. 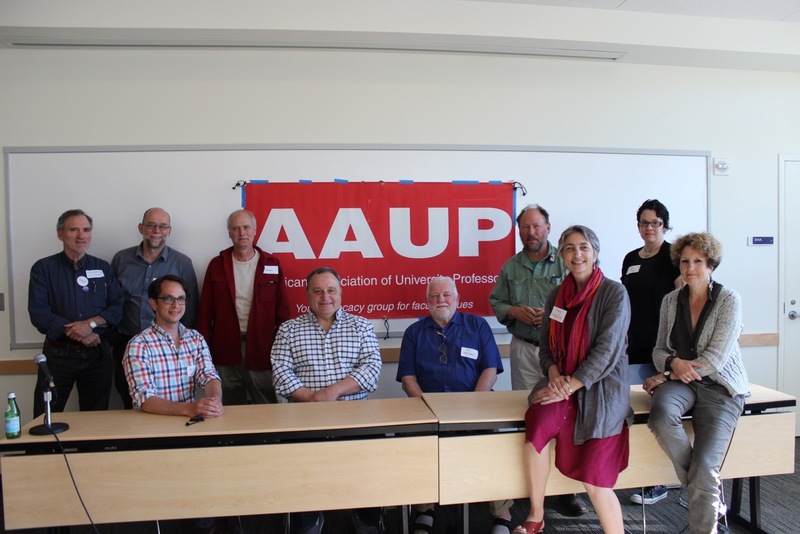 The American Association of University Professors (AAUP) is 100 years old this year, with the UW chapter active since 1918. AAUP advocates for faculty being at the forefront of academic decisions of the University through meaningful shared governance, opposes the privatization of the academy, and advocates to keep higher education affordable and excellent in Washington State. The Washington State Legislature is currently grappling with the State Supreme Court over fully funding public education following the 2012 McCleary decision that found the state to be failing in its constitutionally-mandated provision of adequate education for its children. Many of us are left wondering how such a prosperous state fails to fully fund even basic education for Washington’s children. Ultimately, the answer lies in our broken and inefficient state tax system. Our state tax system is the most regressive in the nation, and yet billions of dollars of taxpayer money underwrite tax breaks and subsidies each year to wealthy corporations that do not need them. The effect of this tax system is chronic underinvestment in our education budget. Year on year, our state ranks poorly in preparing our citizens for college. A quarter of adults from the ages of 18-24 lack a high school diploma. Tuition in our public universities has skyrocketed, and we fail in our commitment to fully fund the State Need Grant Program to support students through college. And, although the percentage of high-school graduates who go to college has increased in the U.S. over the past two decades, the percentage in Washington has actually fallen. This situation is unacceptable. The moral choice for funding education is clear. The K-12 constitutional mandate could be achieved by diverting funding from other important services, especially higher education. Alternatively, we could view McCleary as an opportunity to work together toward the best solution to generating new revenue streams. We are calling on our Regents to work for new revenue streams to support public higher education. AAUP-UW faculty survey respondents stated that improving the state’s financing of public higher education is a top priority for AAUP. We would like to see the faculty more actively involved in setting the UW’s legislative agenda. We hope that the administration can work with our students, their parents and alumni to get the message to our state’s citizens that new revenue streams are essential for saving education, and particularly public higher education, in Washington. Academic Freedom Award: To the 2013/2014 Faculty SenateFor passing new legislation to safeguard academic freedom at the University of Washington. The award will be presented at the May 15th, 2014 Senate Meeting. Excellence in shared governance: Professor Jack Lee (Mathematics) For strong and collegial leadership as Faculty Senate chair. As Faculty Senate chair, Jack has worked tirelessly to introduce new faculty salary legislation, helped bring new legislation safeguarding academic freedom, and has worked to repair the lecturer track at the UW. Leadership Award: Professor Emeriti Raya Fidel (The Information School)For long-term service to the AAUP-UW chapter and the state conference. Raya continues to serve the chapter by frequently posting news items to the AAUP Faculty Issues and Concerns listserver that are of interest to faculty. Leadership Award: Professor Emeriti Jane Koenig (Environmental and Occupational Health)For long-term service to the AAUP-UW chapter. Jane is the longest serving active member of the chapter, has served as treasurer, and still attends most meetings.